Children In Need is a huge charity in the UK and every November they have a big fundraising campaign. These Children In Need Cupcakes feature their mascot, Pudsey Bear, and they would be perfect for a charity bake sale! 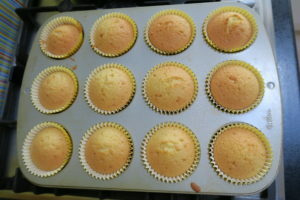 They are vanilla cupcakes decorated with coloured coconut for Pudsey’s fur, and fondant for his facial features. I’m not a fondant expert at all, so I can assure you the fondant decorations for these Children In Need Cupcakes are really easy to make with a few simple tools. 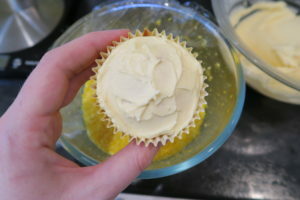 To make the cupcakes I started by creaming the butter and sugar together. 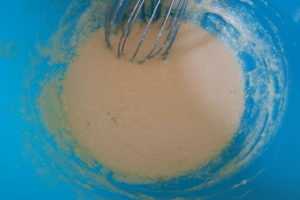 Then I added the eggs and vanilla and whisked them in. 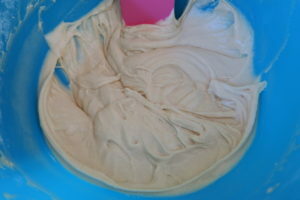 I added the self raising flour and whisked in, then I divided the mixture between cupcake cases. 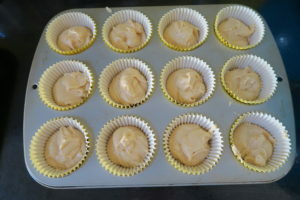 The cupcakes baked for 20-25 minutes until golden. 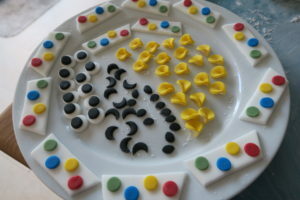 I made all of the fondant decorations and left them to dry out. 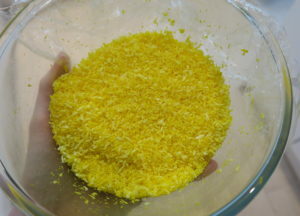 To dye the coconut flakes, I mixed yellow food colouring with some water then added it to the coconut and mixed in until it was yellow. 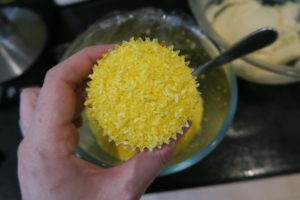 I made a vanilla buttercream and spread it over the cupcakes, then I sprinkled and pressed the yellow coconut onto it. Then I added the facial features and Pudsey’s face appeared! 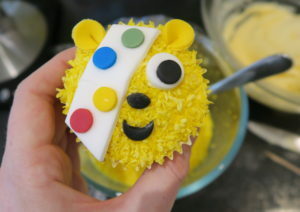 The Children In Need Cupcakes looked so fun and cute! They will go down a storm at your charity bake sale! 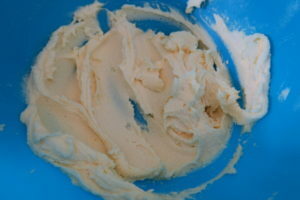 To make the buttercream, mix together the butter and icing sugar with a spoon or electric hand whisk, when it starts to come together, add the vanilla and mix until smooth.